Sindh Progressive Lawyers Forum (SPLF) announced to take two steps immeiately. One, to form a research committee of four lawyers heaed by the president of the forum which will conduct a research into the issue of selection of judges in both lower and higher courts. Second, file a reference against the former Chief Justice, Sindh High Court, and current JUstice Supreme Court of Pakistan, JUstice Mushir Aalam for giving discriminatory remarks against people live in interior parts of Sindh. In a statement issued by the Forum on its letter pad below statement was issued. Recently formed forum named Sindh Progressive Lawyers Forum which in its reaction to the statement of former Chief Justice of Sindh, Justice Mushir Alam, and now Justice of Supreme Court, held an urgent press conference on 15 September, 2013 at press club Hyderabad and lodged a protest against the statement of former CJ. Forum members strongly condemned the biased attitude of Chief Justice and expressed their disappointment on it. The press conference of Sindh Progress Lawyers’ Forum ignited reaction in all over Sindh by the Bar Association which held a joint press conference at the High Court Bar Association, Hyderabad and gave a call for province wide boycott of legal proceedings to protest against the remarks of former CJ Mushirr Alam. Majority of the legal fraternity is of the opinion that the statement of the former CJ High Court Sindh has hurt the feeling of people live in interior Sindh. Most of the Bar Associations across the province announced boycott of the court proceedings on 21 September 2013 as a non-violent protest against the statement of the former CJ. 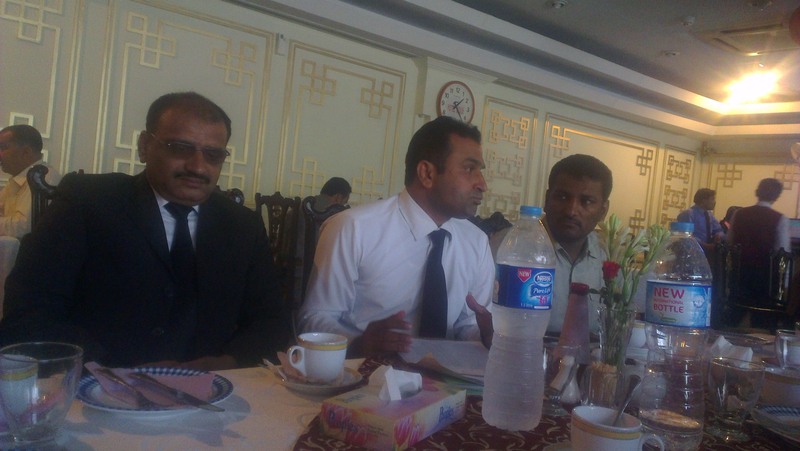 Sindh Progressive Lawyers’ Forum (SPLF) took special efforts for the compliance of the strike call. Strike call went successful in most of the Bars despite the fact that the Sindh High Court directed judicial officers across the province to pay no heed to Sindh Bar Council’s (SBC) call to suspend legal proceedings. Through strike, all Bar Association unanimously condemned the statement of the former CJ and all lawyers abstained from the court in most of Sindh province. In order to assess the impact of the strike and to design furutre strategy of the forum on this issue an urgent meeting of the forum was held at Indus Hotel Hyderabad in which following two decisions were made. 1. Formation of Research Committee: The committee consisting of four lawyers headed by the president of the forum will conduct a research into the issue of selection of judges in both lower and higher courts. The issue of elevation of the judges in the Higher Courts has always been bone of contention between lawyers and the judiciary. The research will collect the facts, make a case and present before the Bar Association for awareness and judiciary for justice with lawyers of interior Sindh. The research committee includes Sajjad Chandio, Abbas Haider Gad, Zarina Nawaz. 2. Formation of Reference Committee: A committee of four lawyers headed by the president of the Forum was formed to prepare a reference and file it against the former Chief Justice High Court Sindh before the Supreme Judicial Council. Forum also decided to get assistance from senior lawyers like Asma Jahangir, Ali Ahmed Kurd and other senior lawyers in this regard. The Committee consists of Mir Ahmed Mangrio advocate and former GS Jamshoro Bar Assoication, Sarward Buledi Advocate member Hyderabad Bar Association,Ayaz Rajpar young advocate of High Court Hyderabad and Zarina Nawaz, young advocate of the High Court. Rest of the issues, newly formed forum will tackle include the capacity building of lawyers, legal reforms, human rights situation in the province, selection of judges in both sub-ordinate and higher courts and issue faced by the lawyer. The Forum members said they have high regard for the judiciary but they cannot tolerate unfairness and discrimination against the population of the some parts of the province.